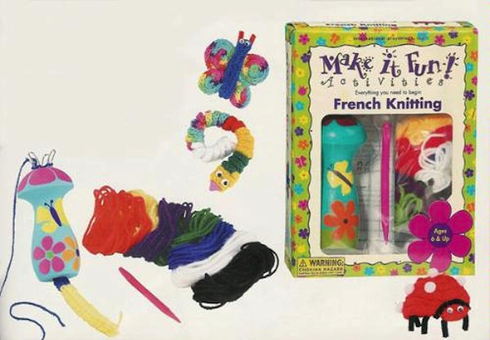 This award winning "Make It Fun" kit has everythiung you need to start French Knitting. Create a long knitted snake that can be coiled and sewn to create fun creatures! This classic craft provides hours of creative fun and is simple enough for a child to do alone, without supervision. Contians wodden flower knitter, 7 colors of yarn, plastic knitting needle and complee instruction. For ages 6 and up. Please note, packaging for this item may have changed from what's pictured above. Contents remain the same.